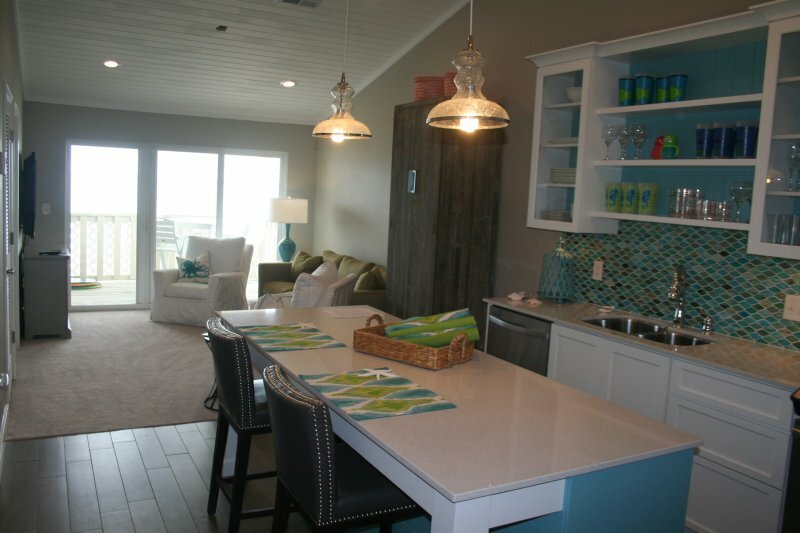 Baywatch E-10, a two bedroom/two bathroom property, has been ripped to the studs and remodeled with an upscale beach décor that will relax and rejuvenate you during your stay. Calming teal and blue tiles accent the kitchen while white granite counter tops keep the clean lines contemporary. 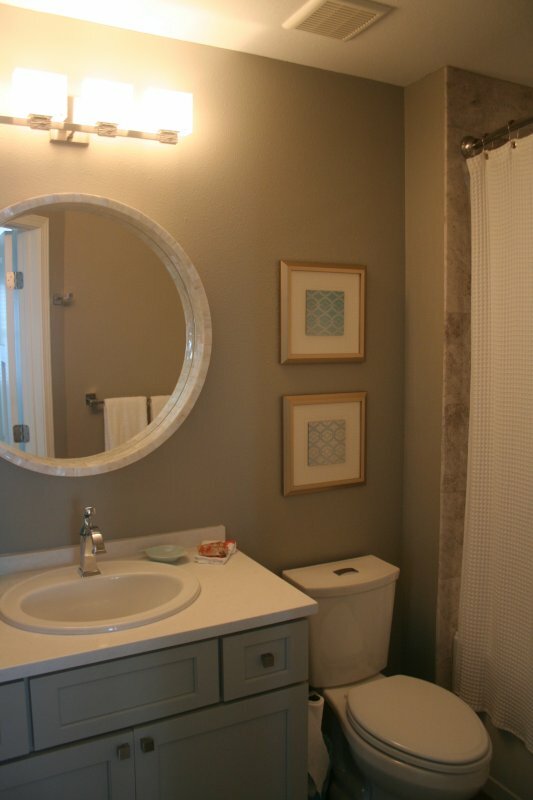 The modern design repeats in the bathrooms with tile and marble showers, stainless steel fixtures and water saving toilets. 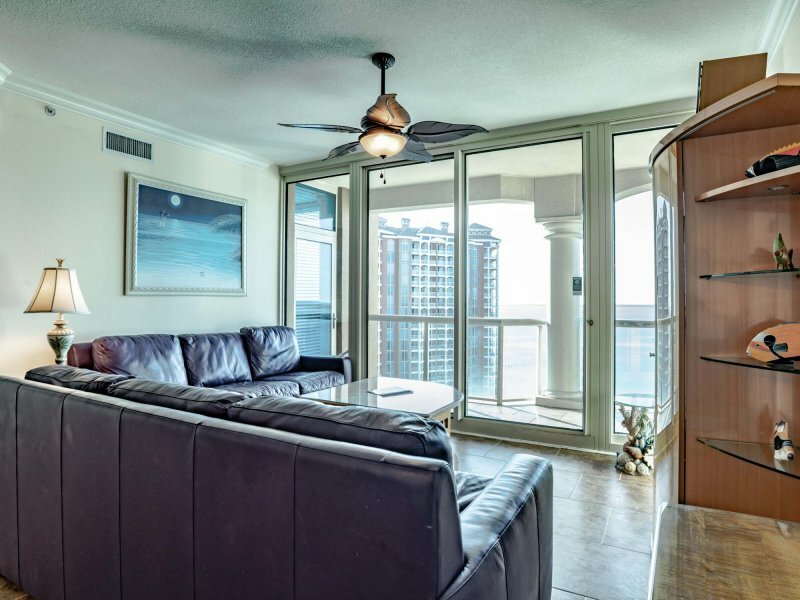 The living room designed around family comfort with multifunction chairs and an overstuffed sofa invites the whole family to sit and relax while taking vies of Pensacola Bay. A king-size bed in the master and a bunk bed with two full-size beds in the guestroom makes this condominium perfect for six people. 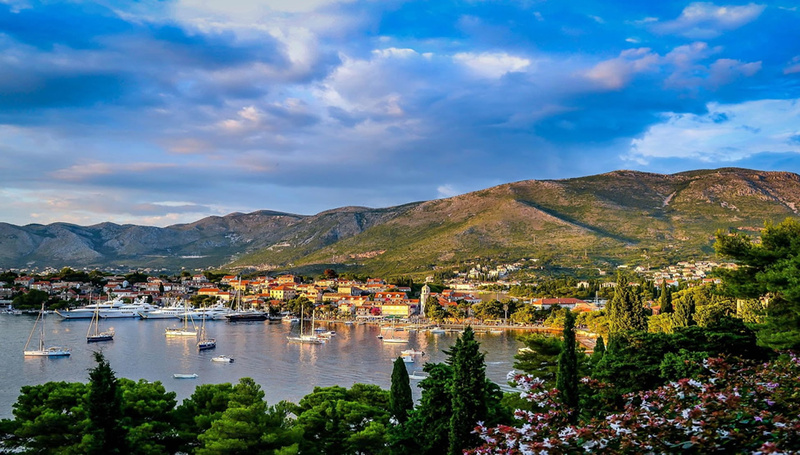 The best amenity of this property would be the incredible views from the top floor. 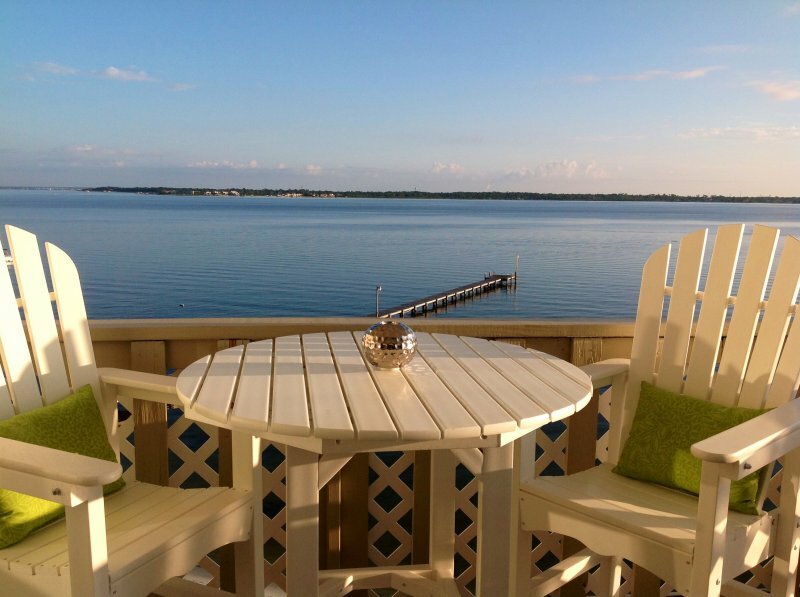 Enjoy your days watching the sailboats traverse Pensacola Bay, and in the evenings you can watch the twinkling lights of Gulf Breeze. 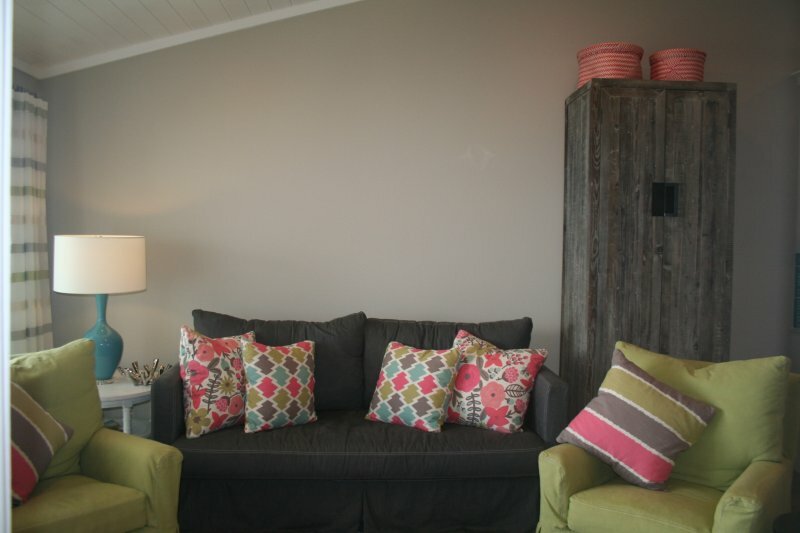 Other amenities include two flat panel TVs, cable television, new deck furniture and bar seating for four people. The Baywatch neighborhood includes a private fishing pier, a pool, and community park- style grill. 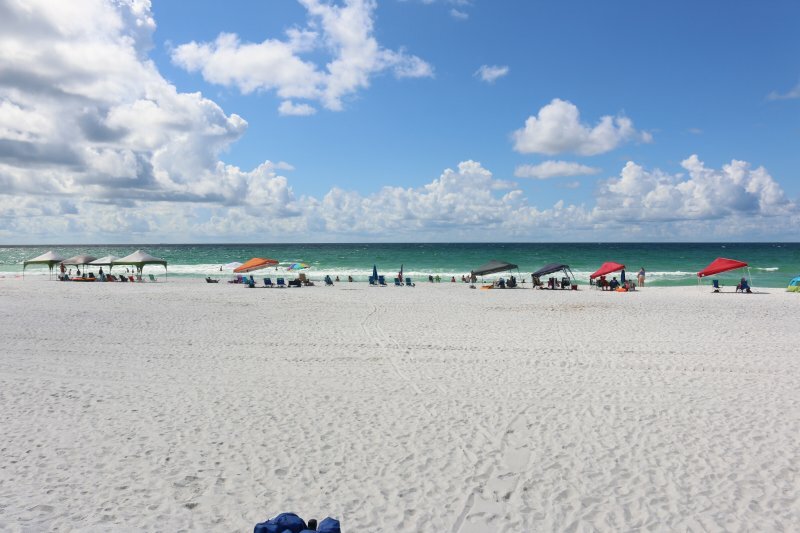 The white sand beaches of the bay are the perfect beaches for the younger members of the family who may not enjoy the larger waves of the Gulf of Mexico. Make plans now to remove the stress from your life and rejuvenate. 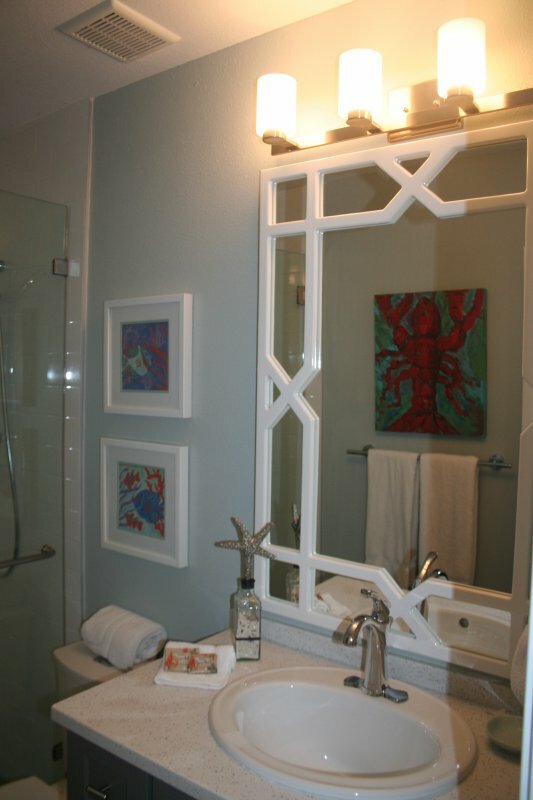 Description Baywatch E-10, a two bedroom/two bathroom property, has been ripped to the studs and remodeled with an upscale beach décor that will relax and rejuvenate you during your stay. 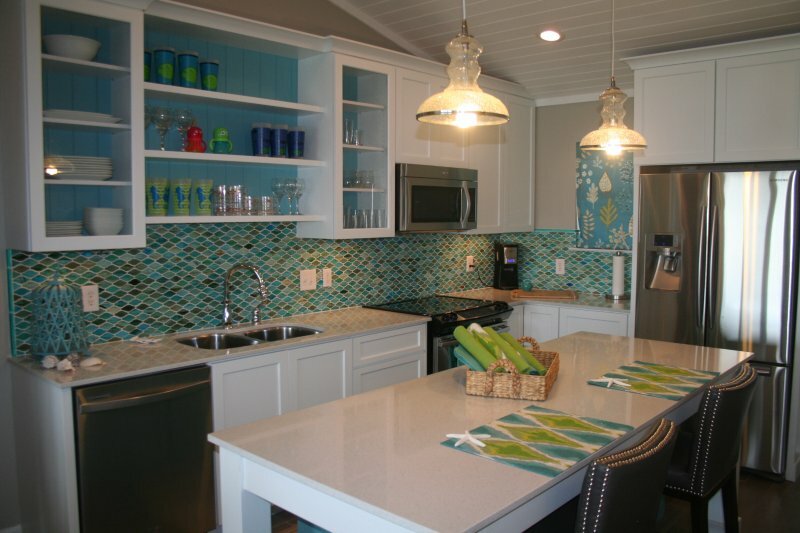 Calming teal and blue tiles accent the kitchen while white granite counter tops keep the clean lines contemporary. The modern design repeats in the bathrooms with tile and marble showers, stainless steel fixtures and water saving toilets. 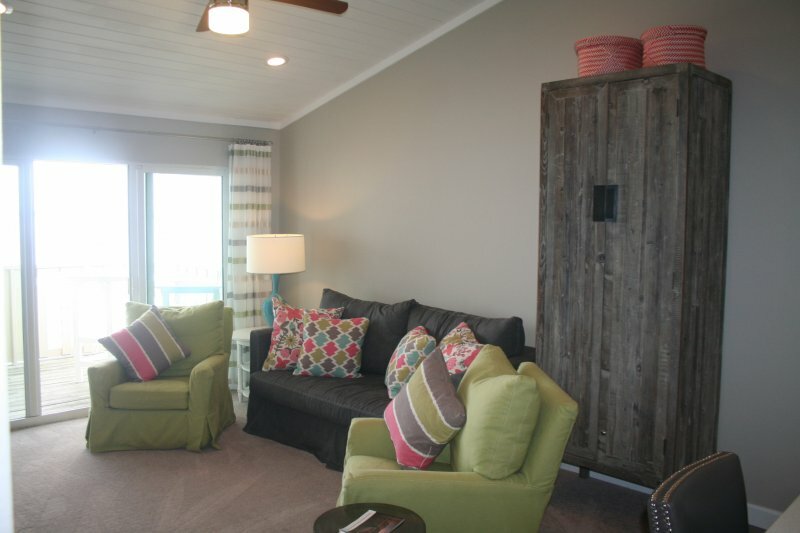 The living room designed around family comfort with multifunction chairs and an overstuffed sofa invites the whole family to sit and relax while taking vies of Pensacola Bay. 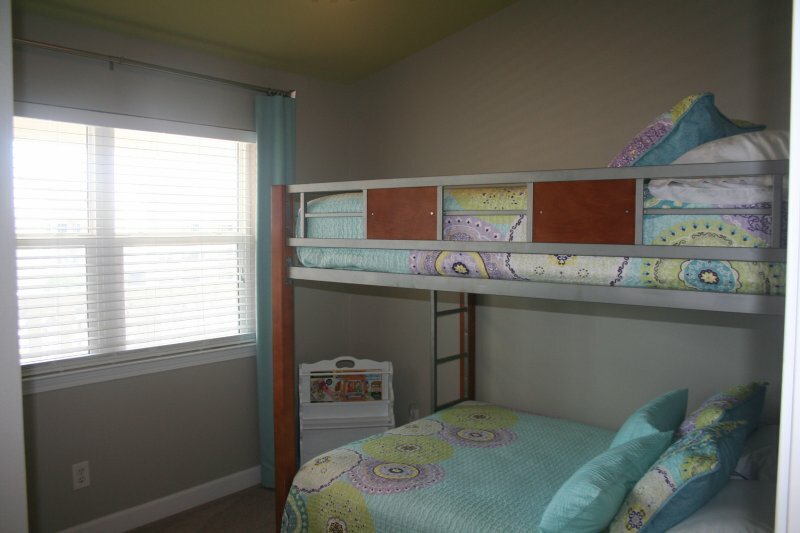 A king-size bed in the master and a bunk bed with two full-size beds in the guestroom makes this condominium perfect for six people. The best amenity of this property would be the incredible views from the top floor. 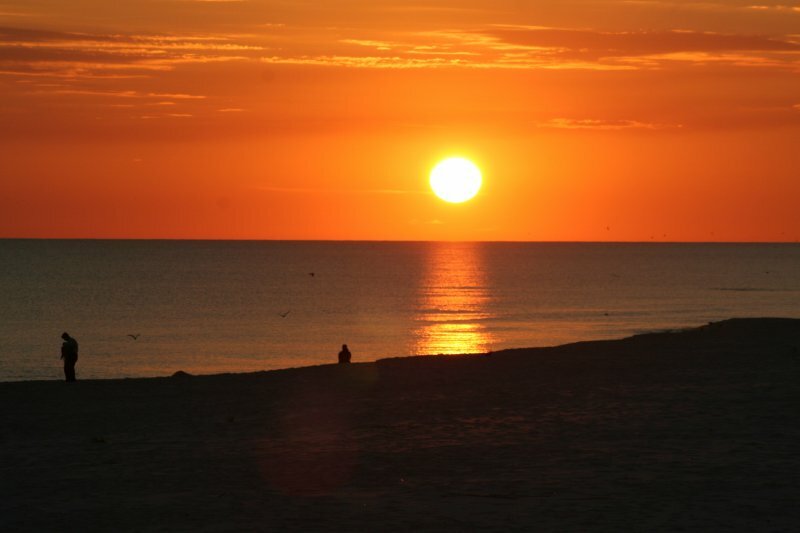 Enjoy your days watching the sailboats traverse Pensacola Bay, and in the evenings you can watch the twinkling lights of Gulf Breeze. 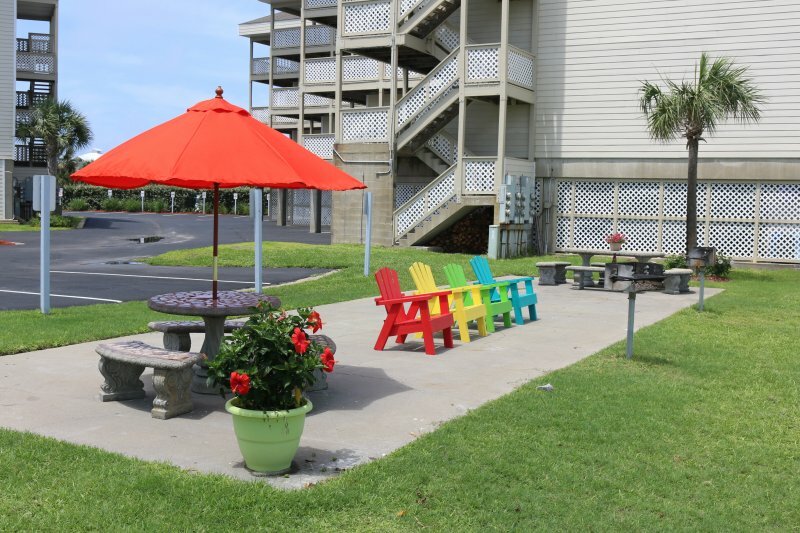 Other amenities include two flat panel TVs, cable television, new deck furniture and bar seating for four people. 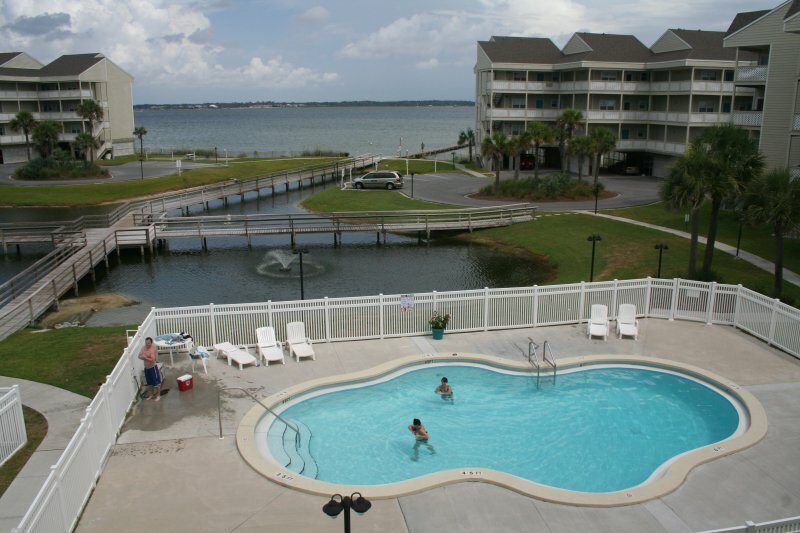 The Baywatch neighborhood includes a private fishing pier, a pool, and community park- style grill. 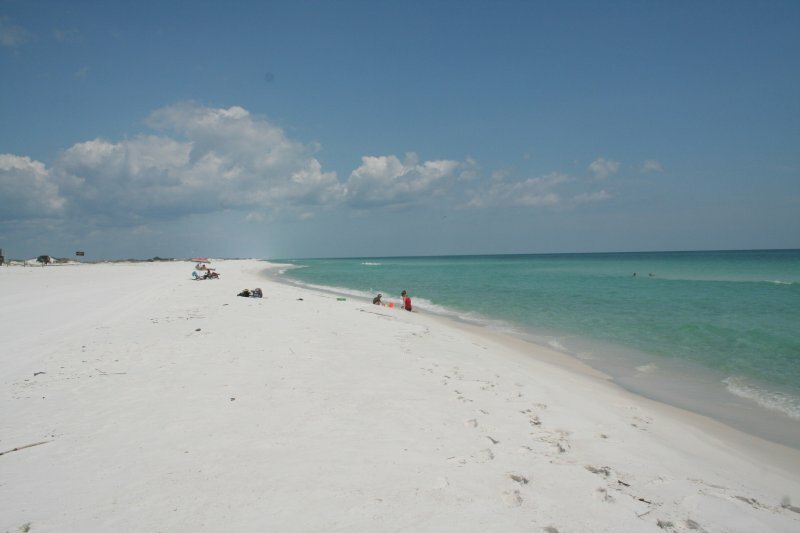 The white sand beaches of the bay are the perfect beaches for the younger members of the family who may not enjoy the larger waves of the Gulf of Mexico. Make plans now to remove the stress from your life and rejuvenate. If this property is not available for your dates, please contact us for other options that may be available. Entertainment System Enjoy the day by watching the activity on the Pensacola Bay. Unobstructed views. Utilities Up to $150.00 in utilities is included in monthly rental rate. Additional Rate Information Additional one-time fees include $200.00 for processing, damage waiver and a background check that is required by the homeowners association as well as a $110.00 fee for housekeeping after your departure. Tax is not included. 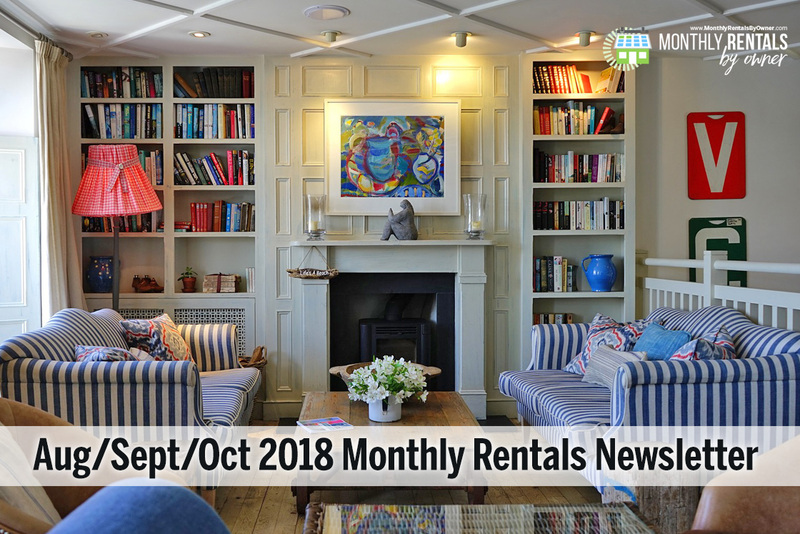 No tax charged if staying over 6 months. 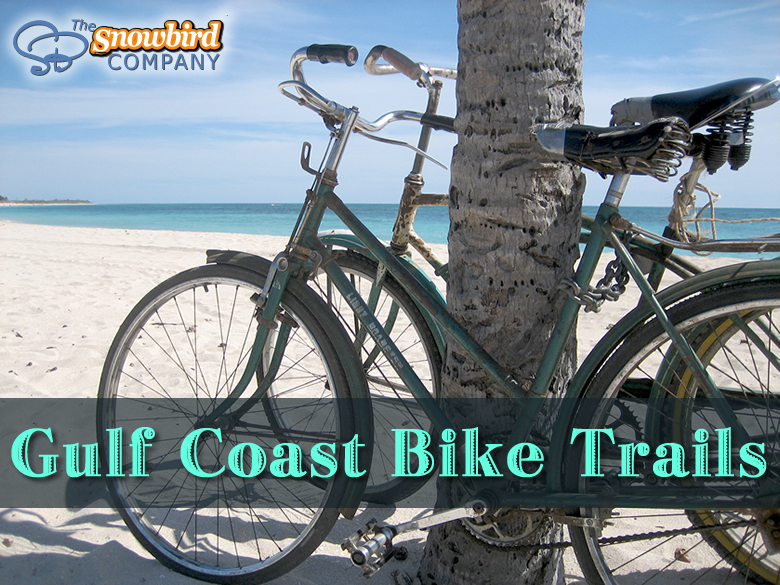 Weekly rentals also available - Call 877-277-6875 for details. Boat launch at Shoreline Park is just across the bay. 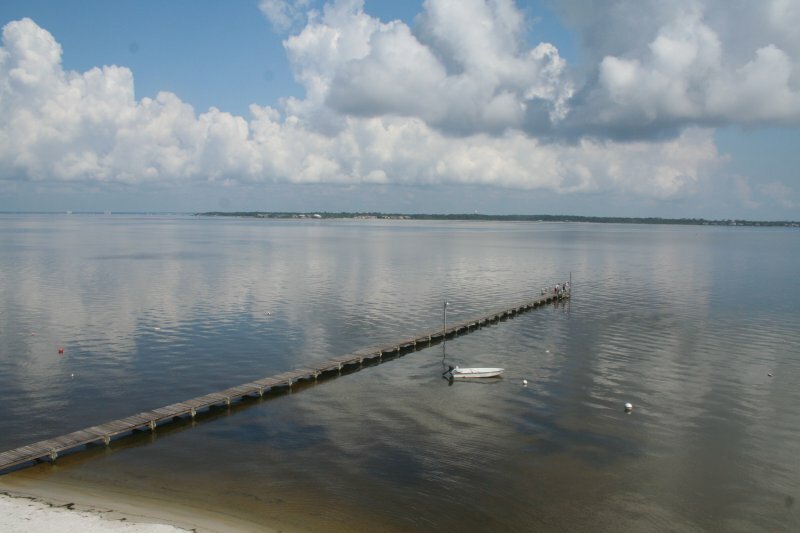 Boats can anchor in the Pensacola Bay. Unobstructed view of the Pensacola Bay and sailboats skimming the calm water.